This could be the Best. Post. Ever. Simply because it has everything you need to know about the parts of a crochet stitch! I’m telling ya.. save this one to Pinterest or print it out and put in your Crochet Journal. This post may contain affiliate links. By clicking on one of these links, a portion of the purchase will go to support this blog. The price you pay will not change. Thank you for your support of this blog. 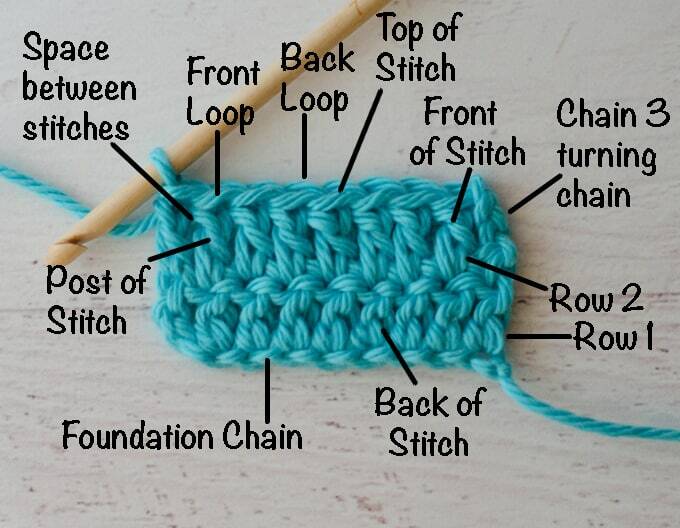 The two photos tell you everything you need to know to identify the parts of a crochet stitch. The top photo shows a few rows of single crochet. When you are following along in a pattern, there might be instructions to “crochet in the back loops” or “crochet in the front loops”. Look at the photos to see what they mean! If you are crocheting in the round, it might be easy to spot the back loop and front loop because it looks just like the photos. However, if you are working back and forth, you will be looking at the back side of this piece and maybe it will throw you. If you’re like me, maybe you would turn your work, and think, ‘oh no..what’s the front?… what’s the back?? … Did they change?’ The back loop will always refer to the back loop of the previous row. The second photo shows a few rows of double crochet. Notice there are a few more “parts” listed here. 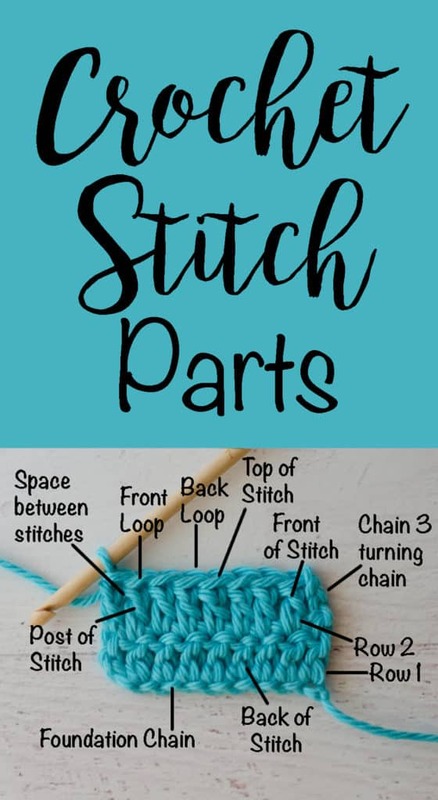 The space between stitches is shown because sometimes a pattern will have you work in between the stitches instead of in the top of the stitch. It is a different look and one you might want to try if you are designing your own piece. A double crochet (and taller stitch) has a post. There are stitches that can be worked around a post that give a distinct ridge to the work. And there you go! Here’s a pin for you to pin to Pinterest! Wow! This site was a jewel to find! Great information and well written. My only wish is that you had a newsletter. If you do have one, please add me to your subscribers list! Thank you for sharing your talent! I’ve been crocheting for 50 years, but you have created some handy visuals for showing to new crocheters, whom I try to help. 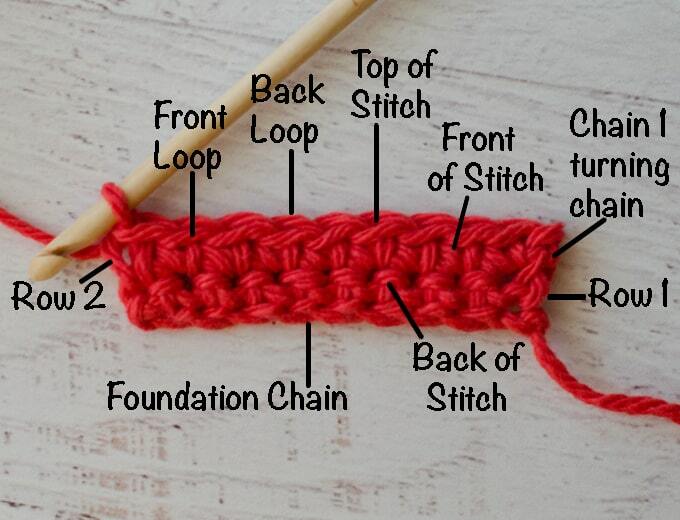 What is the “horizontal bar” of a crochet stitch, especially on a half-double crochet stitch? I have been crochet for decades and only recently read the term “horizontal bar” in a crochet pattern. Thank you. I just read about this as well–and I’ve never actually seen it in a pattern before. So if you look at the post part of the stitch it is the almost horizontal yarn across. A sc wouldn’t have one at all and a hdc and a dc would have 1. It’s basically the yarn over and where it falls in the finished stitch.